Two reports forecasting the expected repercussions of the impacts of climate change to different sectors of the economy have recently been published. Specifically, we will be discussing here the 2014 report entitled “Climate Impacts in Europe”, the final summary report of the European Commission’s Joint Research Centre (JRC)’s Projection of Economic impacts of climate change in Sectors of the European Union based on boTtom-up Analysis or PESETA II Project, and the 2015 report entitled “Economic consequences of climate change” by the Organization for Economic Cooperation and Development (OECD). This is a joint summary of these two reports, because the two share both methodological similarities and the same purpose, namely, to provide quantitative estimates translating the said impacts into economic terms (mainly in percentage GDP) in a series of sectors, notwithstanding the broad range of uncertainty surrounding the repercussions of climate change. The JRC’s PESETA II project produced estimates for the latter part of the twenty-first century in the period from 2071 to 2100 (“the 2080s”) for the European Union as a whole, divided into five regions: Northern Europe, Central Europe South, Central Europe North, the British Isles, and Southern Europe, which includes Spain. The study analyses 10 biophysical impact categories (agriculture, energy, river floods, droughts, forest fires, transport infrastructures, coasts, tourism, habitat suitability of forest tree species, and human health), considering a broad set of climate model simulations (up to 15 for some impact sectors). Eight of those impacts (all but droughts and habitat suitability) have been integrated into an economic model to assess the impact on the overall economy and welfare at the level of the EU as a whole and the aforesaid five regions. The economic analysis of climate impacts has been carried out with an economic general equilibrium model, which allows comparison of the different impacts based on common metrics (household welfare and economic activity or GDP) and also computation of the indirect effects in addition to the biophysical direct effects. The economic analysis considers a hypothetical, counterfactual situation, where the climate of the future is assumed to impact on the economy of today. The JRC’s report has considered four climate scenarios: one in which the current level of emissions is held roughly steady, which will result in global warming of 3.5° C over the pre-industrial average; two variations on that scenario, one slightly drier and warmer and the other slightly colder and wetter; and a fourth scenario positing the reduction in emissions required to keep global warming to 2° C above average pre-industrial levels in the 2080s, as the world’s countries have committed to in the Paris Agreement. These scenarios have produced the following outcomes, by sector. In agriculture, the worst-case scenario yields a drop in agricultural yields of around 10 % at the end of the century, potentially reaching 20 % in Southern Europe. If warming is held to 2° C, agricultural yields would not be much affected. The analysis of the agricultural sector included an additional simulation for the decade of the 2020s that reveals that technical adaptations can improve overall agricultural yields other than in the Iberian Peninsula, though the results for this latter area were highly dependent on rainfall patterns. Energy demand in Europe as a whole could decline by up to 13 % due to lower heating requirements. In the case of Southern Europe, by contrast, energy demand could increase by up to 8 % due to a greater need for cooling. In the worst-case scenario, annual damage to property and personal losses caused by river flooding could double by the 2080s. The increase would be particularly serious in the British Isles and in Central Europe South. Simulating the 2080s economy, the economic damage to property affected by river flooding annually could be more than 10 times greater than today because of the higher value of exposed property. Droughts would become more severe, especially in Southern Europe, where the surface area currently affected each year could nearly double due to this climate risk. The situation with respect to forest fires is similar. Damage to transport infrastructure, above all due to flooding, could rise by 50 %, and damage due to coastal flooding could even triple, to 17 billion euros annually, mainly affecting Central Europe North. Tourism losses could reach up to 15 billion euros a year, with Southern Europe particularly hard hit, with losses of up to 7 billion euros yearly in the worst-case scenario. The rise in temperatures could produce an additional mortality rate of more than 100,000 deaths a year, especially in Central and Southern Europe. The 2 °C scenario would reduce the increase in the mortality rate to under 80,000 deaths/year. In purely economic terms, with impacts calculated on today’s economy rather than on value forecasts for the 2080s, if no emission-reducing measures are taken, annual losses directly attributable to climate change would amount to around 190 billion euros per year, that is, nearly 2 % of the EU’s current GDP. There would be differences in the geographic distribution of the losses between the countries of Northern Europe (0.2 % of GDP) and the countries of Southern Europe and Central Europe South (3 % of GDP). In other words, 70 % of annual losses would be concentrated in these last two regions. In the event the emissions target can be achieved, such that global temperature does not exceed the 2 °C limit, losses would then be expected to stay at the level of around 120 billion euros (1.2 % of GDP). At any rate, the simulation has not taken into account the effects of climate change outside the EU on the European economy, so in the final analysis the real estimates might be a good deal higher. The OECD’s analysis, “Economic consequences of climate change”, has taken global effects into account. Like the previous study, this report was based on a multi-region, multi-sector economic general equilibrium model to relate climate change impacts to specific aspects of economic activity such as labour productivity, supply of production factors like capital, and changes in the structure of demand. The analysis considers losses until 2060, complemented by a more stylized analysis of impacts after that date. The analysis was not an attempt at a realistic forecast of the future situation but rather an endeavour to look at the combined impacts of climate change on GDP by region and by sector and also to look at interactions between the various regions and sectors. Generally speaking, if no mitigation or emission-reduction measures are taken, the OECD study projects annual losses on the order of between 1 % and 3.3 % of GDP in 2060, with a central projection of 2 %. Forecasts to 2100 raise that figure into the range between 2 % and 10 % of GDP. The main losses are from changes in crop yields and labour productivity. Other effects, such as sea level rise, will become increasingly important in the second half of this century. The study modelled the economic repercussions of climate change, dividing the globe into 25 regions. Impacts would be distinctly negative in 23 of these, particularly in the Middle East and North Africa, Sub-Saharan Africa, and South and Southeast Asia (including India). Certain higher-latitude countries (Canada and Russia) could be positively affected, at least until 2060, due to positive effects on health, energy, and tourism. The actual size of the changes, according to the report, will partly depend on the ability of the economies to adapt to the impacts by changing production technologies and patterns of consumption and international trade. In fact, viewing the effects globally, the total losses to GDP are smaller than the sum of the individual losses from the different impacts, indicating that countries may be able to respond to the variety of impacts in a more sophisticated way than to each individual impact separately. Uncertainty is particularly high for certain impacts, such as damage caused by urban flooding, premature fatalities due to heat stress, loss of ecosystem services, and triggering high-impact singular events. The authors have estimated that the cost of inaction shown in the report most likely underestimates the real costs of climate change impacts. The OECD report has drawn a series of policy conclusions, mostly emphasizing the urgent need to undertake action to lessen and minimize the negative impacts without delay. These adaptation policies could contain losses at the end of the century to a little more than 1 % of global GDP, and implementing ambitious mitigation policies could avert half of the projected losses for 2060, though significant losses would persist in vulnerable regions, such as most of the countries in Africa and Asia. If ambitious mitigation measures are not implemented, partial measures could mean lower costs in the first decades of the twenty-first century but would entail much higher long-term risks, though this result is highly dependent on the choice of discount rate. The reduction in losses would be spread across all the sectors, but in the short term adopting mitigation policies would mean that some sectors would have to bear heavier adverse economic effects than others, especially agriculture, energy production, and industry. Adoption of mitigating measures, on the other hand, might entail less sacrifice for the service sector, which would broadly benefit from the effects of such measures. Neither the OECD report nor the European Commission’s report has evaluated damage caused by climate tipping points. These include the melting of alpine glaciers, Arctic sea ice completely melting in summer, Greenland ice sheet meltdown, and collapse of the Atlantic Thermohaline Circulation. Both reports have stated that if any of these effects occur, this could give rise to non-linear consequences that would be extremely severe, although difficult to quantify. The OECD analysis, though, has made use of the subject of tipping points to make one of the few indirect references to insurance, at least according to its terminology. In view of their potentially huge economic consequences, the likelihood of triggering one of these climate tipping points could be interpreted in cost-benefit terms or in terms of the risk premium rate applicable to current emission levels, reflecting the potential long-term implications. Some studies carried out by climate economists have indicated that a high degree of aversion to the risk of triggering these tipping points would mean assuming a risk premium equal to 100 % of the socioeconomic cost of the carbon-based economy. In other words, utter certainty that these potentially devastating events will not occur can only be attained by putting a complete stop to emission-producing activities, something that is obviously unfeasible. However, given the uncertainties, for instance relating to the emission thresholds that might trigger these effects, a risk neutral approximation would entail a premium of 10 % of this cost. That is, despite all the uncertainties, an ambitious mitigation policy would be a guarantee of lowering the risk of crossing these thresholds. Once again, the perception of risk is basic to implementing large-scale mitigation measures, but the size of the problem is such that these mitigation measures would also need to address the issue of the moral risk intrinsic to the measures. In conclusion, despite the many uncertainties and challenges posed by analyses of this kind, these two reports constitute an interesting exercise in translating climate impacts into economic impacts and further can estimate the difference between taking ambitious adaptation and mitigation measures right away and not doing so. In any case, the authors are cognizant that the main problem attaching to exercises of this kind is that, while the physical uncertainties surrounding future climate behaviour are great, the economic uncertainties are greater still, in that they are affected by many different kinds of factor. For example, the worst outcome for Europe’s GDP presented by the PESETA II report - a cost of 10 % of GDP in the year 2100 - is comparable to the decline in Spain’s GDP between 2008 and 2012 as a result of the recent economic crisis. Ciscar J.C. et al. (2014). Climate Impacts in Europe. 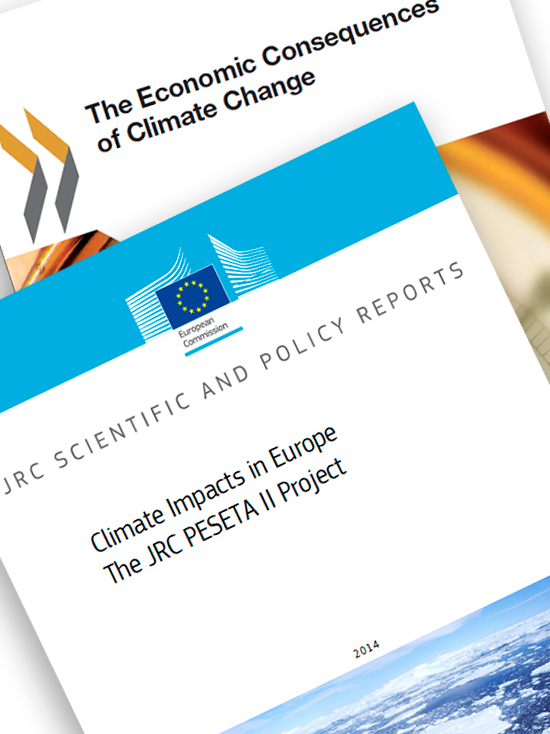 The JRC PESETA II Project. JRC Scientific and Policy Reports, EUR 26586EN, Publications Office of the European Union, Luxembourg. OECD. (2015). The Economic Consequences of Climate Change, OECD Publishing, Paris. Two reports forecasting the expected repercussions of the impacts of climate change to different sectors of the economy have recently been published. Specifically, we will be discussing here the 2014 report entitled “Climate Impacts in Europe”, the final summary report of the European Commission’s Joint Research Centre (JRC)’s Projection of Economic impacts of climate change in Sectors of the European Union based on boTtom-up Analysis or PESETA II Project, and the 2015 report entitled “Economic consequences of climate change” by the Organization for Economic Cooperation and Development (OECD).